Sometimes you need a specialized program to print barcodes, generate random user IDs, or perform other unique processes. We often design and deliver these types of projects in just a few days. A completely-automated PC-based Fuji digital camera control program was needed that can be operated by temporary employees with only 5 minutes of training. This product takes the photo, overlays it with customer graphics, uniquely identifies it and associates it with a barcode scanned ID, then sends it to a Web site for access by the visitor. It is now on a national tour with Build-A-Bear. 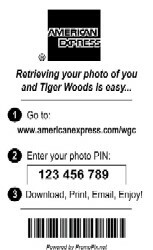 When PromoPix.net needed to print barcodes on the back of credit cards for American Express for promotions at the US Open Tennis and Golf tournaments, we were the ones to do it. This application attaches E-mail addresses to JPG photos taken on a Sony Clie' Palm OS device. Creates a CSV file on the Memory Stick that can be exported with the associated JPGs and used to send them to the E-mail addresses.